Improves tone, texture and firmness for maturing skin on the neck. Why do you need a separate neck cream? The answer is gravity. Because gravity is always pulling on that delicate skin on your neck it may be one of the first areas to show signs of aging. Neck-specific treatment creams work harder to plump up thin, loose skin; they tend to be more emollient and have skin-tightening agents. 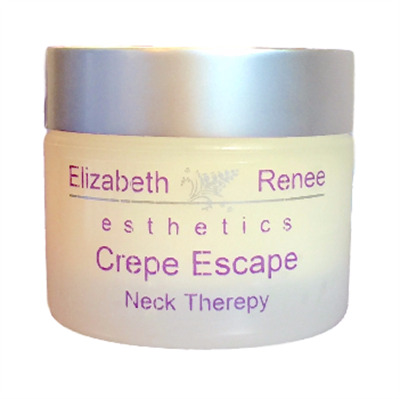 The top performing ingredients in Elizabeth Renee Esthetics' Crepe Escape address the most visible signs of aging on our neck. Clients often see results within a couple of weeks. They experienced less puffiness on the neck and jaw line and improved texture going from slightly crepey to smoother, firmer, tighter skin. Saccharomyces Cerevisiae Extract - A form of Bakers Yeast that dramatically improves texture, hydration levels and skin brightening. Clinical studies report 43% increase in blood flow ot nourish the skin of the neck. MCT Alginate - This natural brown algae helps break down and free fatty acids to stimulate fat cells to release the buildup of unwanted toxins. This helps to sculpt and slim the tissue on the neck area. Palmitoyl Oligopeptide & Pamitoyl Tetrapeptide (Matrixyl) - Peptides ahelp protect skin's collagen from the effects of UVA damage and contribute to skin firmness by promoting collagen renewal. Malus Domestica Fruit Extract - This rare Swiss Apple extract is incorporated into this creme because it has special longevity properties to help protect skin cells to repair themselves from within. Apply twice daily to; neck, chin, and decollete areas in an upward motion, after cleansing and toning the skin. Recommendation; use Advanced Protection SPF 30 for day time regimen, after applying Neck Reserve Creme.